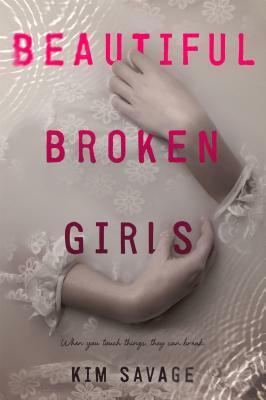 The first thing that drew me to Beautiful Broken Girls was the stunning cover. If you know me at all, you know that I can't resist a gorgeous cover! Then there's also the fact that this was written by Kim Savage, who also wrote After the Woods, which I read last year and really enjoyed. I was super curious to start this to see what adventure she would take us on next. The storyline for the book reminded me a little of Jay Asher's 13 Reasons Why, mostly in that the storyline revolves around a main character, Ben, who is looking for clues that his girlfriend left for him to explain her death. We read the story not only from Ben's point of view, but through the girl's point of view as well, which was really interesting to have both sides of the story. I always love this, as I feel we get so much more information when an author writes this way. This book was a really quick read; I read it in just a day's time, which doesn't happen often lately. I was hooked as I turned the pages, and while I had a couple of questions as I closed the last page, I felt that it all wrapped up nicely in the end. I definitely want people to check this book out, so that they can come and discuss it with me! Overall; the beautiful cover for Beautiful Broken Girls may have drew me in, but it was the mysterious and intriguing story that made me stay. I really enjoyed this book, and I'm now even more curious to check out Kim's next book, In Her Skin, which is due to release early next year! Yes, the cover is very beautiful (that's what made me read the blurb). This was my first Savage book, and I found her writing beautiful. Great review.